Tcrd and Tcrg display identical developmental programs that depend on the activity of the enhancers Eδ and Eγ being “on” in pre–β-selection thymocytes to activate transcription and V(D)J recombination of the unrearranged genes and “off” in post–β-selection CD4+CD8+ double-positive thymocytes to inhibit transcription of the rearranged genes and avoid the expression of TCR δ- and TCR γ-chains in αβ T lymphocytes. Eδ and Eγ activity depends on transcription factor binding to essential Runx and Myb sites and parallels that of Notch signaling. We performed Notch gain- and loss-of-function experiments and found that Notch signaling activates Tcrd and Tcrg transcription by favoring the recruitment of RUNX1 and MYB to the enhancers. 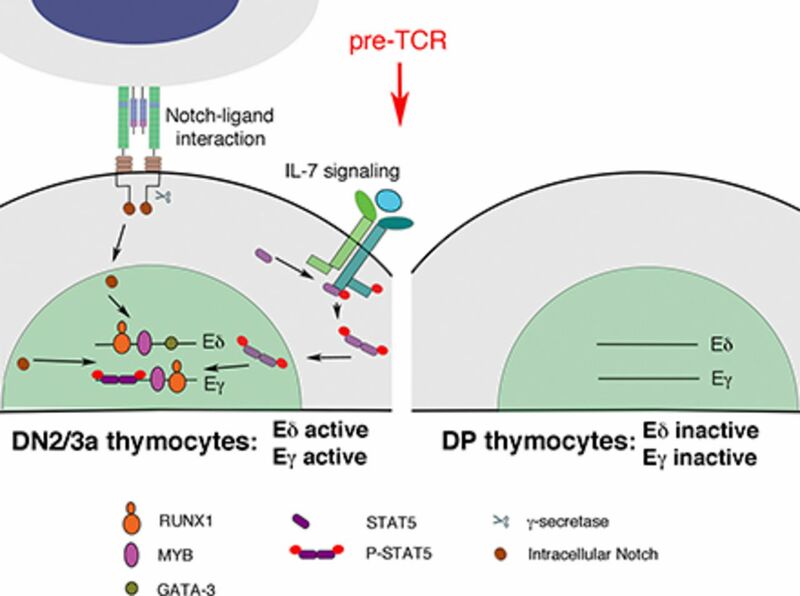 Our results suggest that the dissociation of RUNX1 and MYB from Eδ and Eγ chromatin in double-positive thymocytes, which results in enhancer inactivation, is caused by decreased Notch signaling triggered by pre-TCR signaling, thereby deciphering the molecular mechanism of Tcrd and Tcrg silencing during β-selection. These findings reveal a novel molecular mechanism for gene regulation via Notch signaling through the recruitment of RUNX1 and MYB to enhancer chromatin during thymocyte development.